Cleo Wolff | The Secretan Center, Inc.
Cleo Wolff is an organizational consultant who specializes in linking culture and leadership to best performance in organizations. Human Capital Alignment is her core purpose. 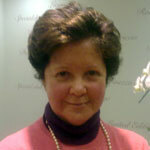 Cleo is a psychologist with specialization in Organizational Development. Cleo is certified as an executive coach, Action Learning Coach and works as a senior consultant with Denison Solutions.